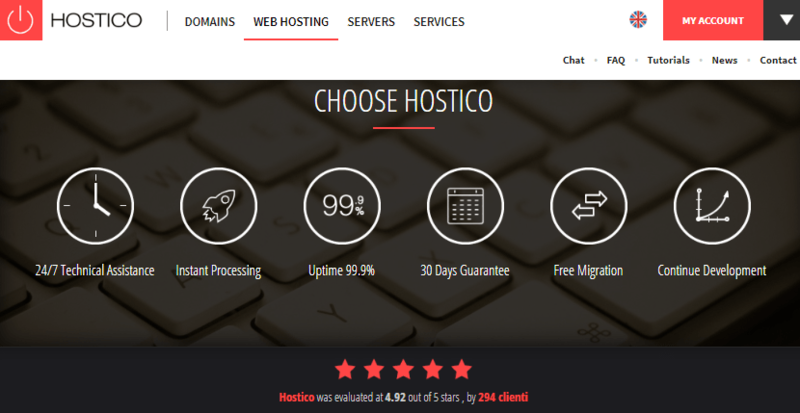 Hostico Review 2019: Is Hostico a Good Hosting? Hostico is a Romanian IT and web hosting company that also provides VPS, dedicated servers, and domain registration services to individual customers and businesses. They offer low-cost hosting plans and 24/7 supports at all levels. Hostico specializes in web hosting, VPS, and dedicated servers, although they also offer domain registration, SSL certificates, backups, and content delivery networks (CDN). Their servers are located in an ISO 9001 certified data center in Bucharest that has redundant network connections. With a range of flexible plans, Hostico provides full support for English and Romanian customers, and their mobile-friendly website is easy to navigate. Unlike some hosting companies in Romania, Hostico operates powerful servers with fast network connections. Secure and optimized for speed, their servers are accessible from multiple locations around the world. The best part is that via R1Soft CDP they provide automatic and incremental backups for customers with shared hosting plans or VPS OpenVZ servers. This is accessible from the cPanel. You can easily create a website using their SiteBuilder tool, or deploy a CMS website with MySQL databases using the Softaculous app installer with over 100 free scripts. The scripts help you build personal blogs, forums, photo galleries, and e-stores within minutes. And you don’t need to have any programming knowledge or experience to get started. With shared hosting, you can sign up for the personal, business, or SEO hosting plan with up to 25GB SSD storage. Their hosting accounts come with SSL certificates, automatic backups, a number of dedicated IPv4 & IPV6 addresses, and web-based emails. If you sign up for their annual plans, you will get a free .com domain and free website transfer. Moving up from the shared hosting, you will find customizable SSD virtual servers with full support for OpenVZ and XEN virtualization technologies. You can choose any of their virtualized machines that have Intel Xeon or Westmere CPUs with up to 1.600MHz DDR III RAM. When you scale to the Midi SS servers, you get more storage space and processing power including unlimited monthly traffic and a dedicated IPv4 address. With the OpenVZ VPS Midi server, you will get a machine WHM/cPanel, a lot more storage space, unmetered bandwidth, and high read/write speeds. Oh, and free technical support. Website availability can mean the difference between profit and loss for any business. With a 99.9% network uptime guarantee, Hostico ensures that your websites and apps are fully accessible 24/7. So you can rest easy. Migrating to Hostico is oh-so-simple. As soon as you sign up, just ask the technical support team to assist you with migration to cPanel. They will carry out full migration of your website, databases, and emails, so you won’t have to start from scratch. All hosting accounts are powered by cPanel, the world’s most popular administration interface. You can set up emails, create databases, monitor website statistics, and even acquire SSL certificates and storage space. Hostico’s price plans compare favorably with other hosting providers, and you can pay via your Visa card, MasterCard, bank transfer, or PayPal. I like the fact that they offer free website transfers, a free.com domain, and free SSL certificates. And the best bit is that all web hosting and VPS packages come with a 30-day money-back guarantee. With a reliable technical support team that speaks English and Romanian, Hostico provides round-the-clock professional assistance on a myriad of hosting issues. Onsite data managers are on standby to reboot servers, replace faulty hardware, and change backup tapes. But that’s not all, because they also monitor the performance of your servers to ensure they’re running smoothly. You can access all this support via live chat, email, ticket, or a phone call between the hours of 8.00 am and 10 pm. Hostico offers stable shared hosting and powerful VPS with SSD disk storage, plus professional support, at a price that is hard for its Romanian competitors to match. Wondering how Hostico stacks up against other Web Hosting companies? Enter any other Web Hosting company and we will give you a side-by-side comparison.